It is that time of the year again where you end up "Waiting Up" for whatever reason. Show us what your waiting up for at this time of the year!! 1. A minimum of (5) Freebies must be included in your image along with Links to the freebies you have used. For an item to be considered free it must be offered as a freebie for the whole month. The exception to this rule is all Daz Weekly Freebies will be allowed throughout the entire month in which they are free as well as the month following their release as a freebie (For a total of 2 months). Also, if a freebie is broken down into multiple downloads/links/parts (IE like if the freebie is broken down into 3 zips etc...)it only counts as 1 freebie, not 3. This Freebie Challenge will end Sunday December 31th @ 23:59 Daz time. Post your images and freebie links here for link verification. Once the links are verified, you can post your image and links in EntriesThead for judging. It's December and Christmas is coming, so of course I had to do something like this as my (first) entry. * Window frames are made using primitives (cube) and textured with a wood iray shader that came with the Studio. * Wall elfs were made by using pattern I had (scanned on my computer) and a primitive plane. * Christmas textures used on the bed, curtains and pyjamas found from http://www.vectorfree.com. Also wall texture is from there. What an amazing render to start off this months contest!! An old entry for an RDNA contest. Wow Pete!! 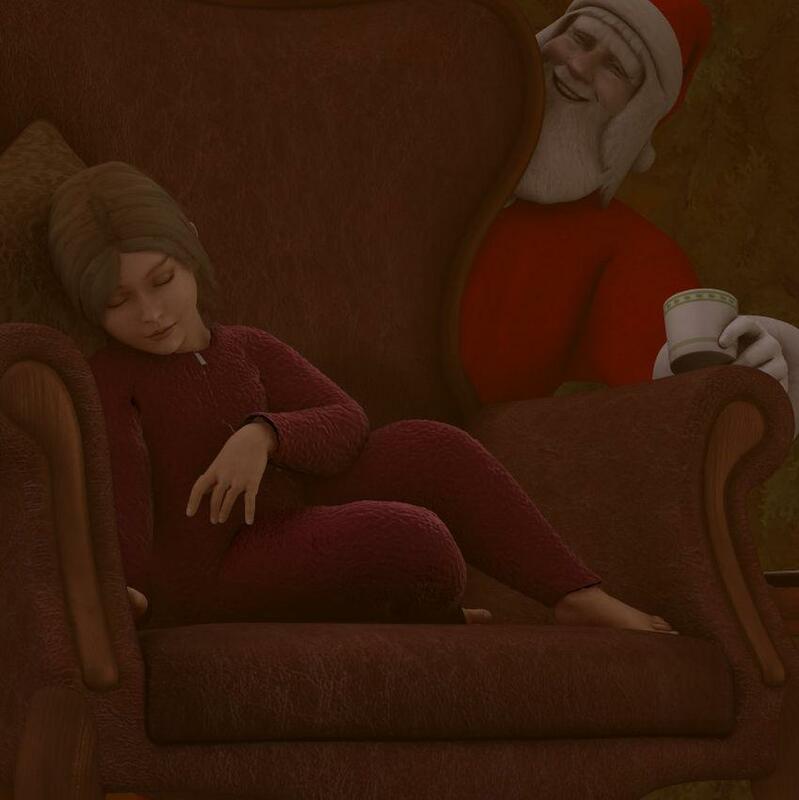 What an incredible render, I feel like I am looking @ a picture of my granddaughter sitting in our arm chair waiting up for Santa!! Aww.. totally one of my favorite themes. I'll have to see what I can do with it this year. 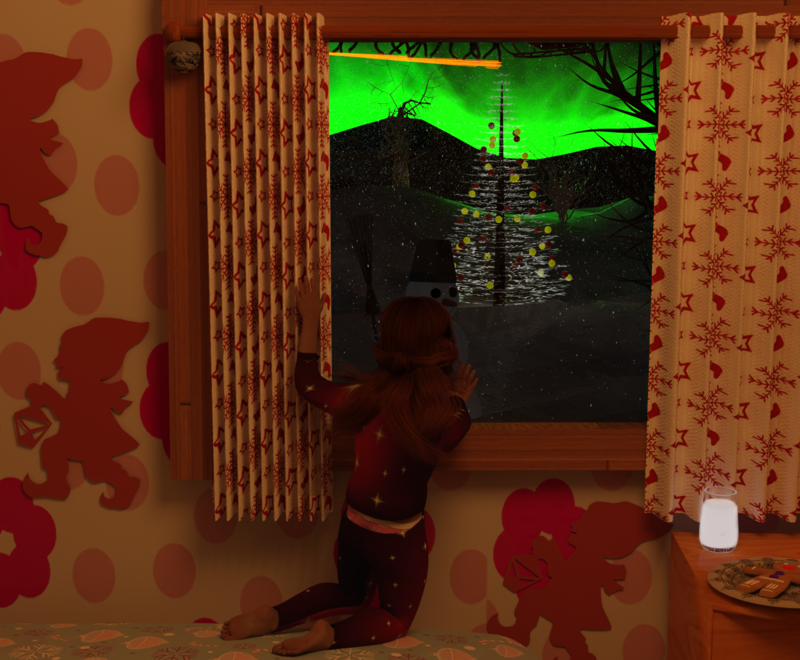 This is from last year - had it printed poster size at Walgreen's and framed for my granddaughter for Christmas (she's the model in render). Awww that is such a beautiful render Chameo and your Granddaughter is too cute!!! Title "Code Green. Nothing is stirring. Not even a mouse. I repeat, Code Green." Free Morphing Tissue, as tree stand - ... From Daz "sick" kit Dec 2017. Shaded with Iray Leather, then White base, with Displacement for the Fuzzy. Hey! I discovered something! I have two morphing tissues in my library. I believe this is the other one, not from the sick kit, but from Adam Thwait - because his morphs in the middle to a peak. Tho - they are named the same, which caused the confusion. I'll fix it in the Entry thread. Keep them renders dropping in here only 2 weeks to go before we all find out what we have been waiting up for!!!! I made this over a week ago, but didn't feel like posting before there was at least one other entry besides my first one. A little girl waiting up her daddy to come home. The lawn, the driveway and the "divider" between them made with primitives and some textures. I have plans, just hope I have time to finish. I sure hope you do have tim to finish Zamuel!! No post work except to sign the image. Environment: Sky * Skydome by glaseye. Environment:Décor:Bow on Picture Frame * 3D Bow Model by Diane. Environment:Décor:Bows, Presents Christmas Tree by Age of Armour. Environment:Décor:Chair Armchair 3D Model by Arkady Kazaryan. Environment:Décor:Rug Morphing Magic Carpet by HyperKnux. Environment:Décor:Stocking Stocking Prop by Mada. Environment:Décor:Toys Rocking Griffon by Summoner. Environment:Décor:Toys * 3Dman's Hobbes by 3Dman. Environment:Décor:Wreath Holly Holiday Props by Gareee. Mouse on Table * JT Mouse by Jtrout. Mouse Poses * JT Mouse poses by tabbycat. Room:Curtains Curtain N210914 by Ellis. Room:Fireplace Brick Fireplace 0.0.0.1 by Age of Armour. Room:Floors (plane with this shader) Tropical Christmas Materials for DS3 and 4 by mmalbert redeyecat. Room:Window Grail * Ancient-Parts-&-Pieces by A::DP. Santa * Klaus by Sixus1. Shader: Santa's Clothing Plushies Shaders for DAZ Studio 3.1+ by mmalbert redeyecat. Shader:Walls, Chair, Curtain, Lamp shade Gentlemen Adventurers - Courtier by mmalbert redeyecat. Shader:Picture Frame * Shortcut Shaders by Sha. * - indicates free registration is required. Environment: Sleigh Mecha Sleigh by Sixus1. Environment:Backdrop Cyclo Drop by Traveler. Environment:Backdrop Schonee's Snow Days by Schonee. Environment:Décor:Candles Yule Log by Amaiya3d. 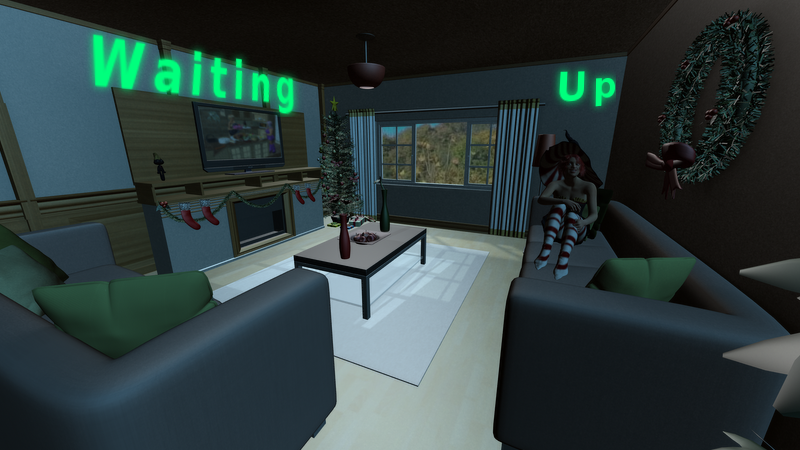 Environment:Décor:Decorations, lights Gothic Tree Decorations by Deerpath. Environment:Décor:Lamp Living Room AS by SAMS3D. Environment:Décor:List in Santa's Hand Santa's List by BloodyRoses. 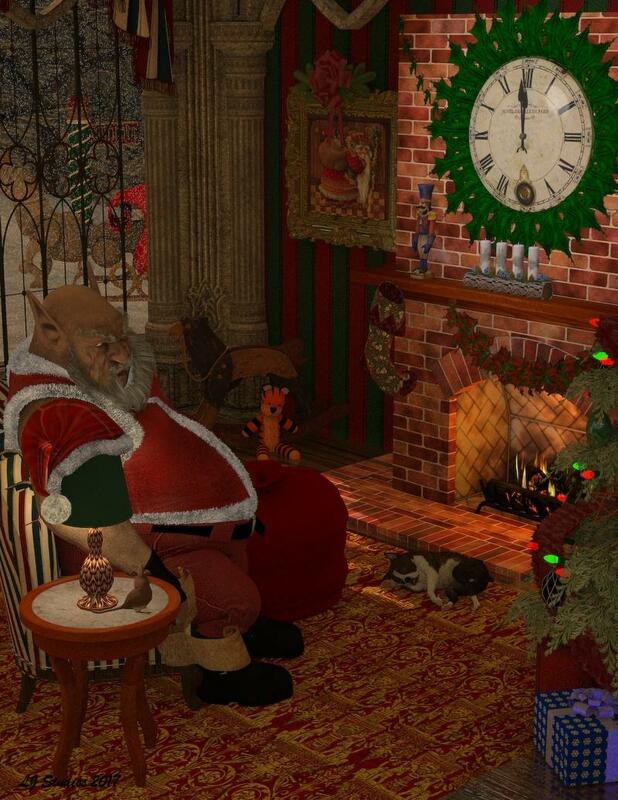 Environment:Décor:Picture Decoration PC Big Xmas by Traveler. Environment:Décor:Present Big Package by Traveler. Environment:Falling Snow SnowLand and North Pole Props by Traveler. Environment:Garland Garland and Ornaments by Traveler. Environment:Snow Cranksville Jail by Mint3D. Shader:Snow WinterLand Fabrics - 23 Ice and Snow Shaders by Calida. Environment:Décor:Bag Santa Sack by Lourdes Mercado. This is a DAZ PC free item. So it counts because to get it you have to join the PC. Mrs. Claus waits patiently for Mr. Claus to return home. Santa has just one more present to deliver. There is still a couple more days to get those amazing Waiting Up Renders In!! 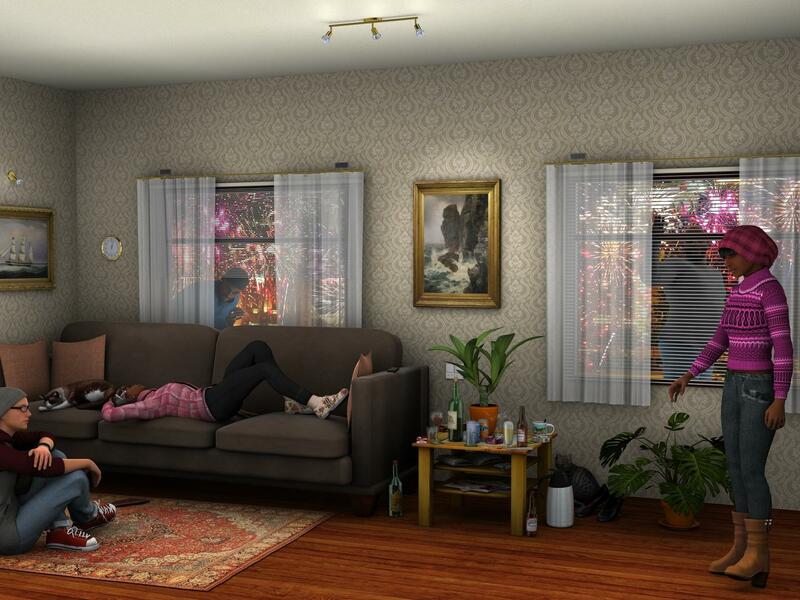 "Waiting up on New Year's Eve..."
Good to see more great renders coming in before the deadline! This copy was downloaded from my phone. I will upload a better copy Tuesday when I have access to a proper computer. Sometimes you have to pour another cup of coffee to make it. Sometimes it's effortless. But there is always a magic to watching the sun creep back over the horizon. Big Cat 2 – via Daz3d, Leopard, retextured to a french snow leopard.